"The second I get a contract on the novel, I'll quit my crappy job, and make something of myself"
When it comes to Stan Lee's BOOM! universe, the 'little publisher that could' definitely left the best for last. 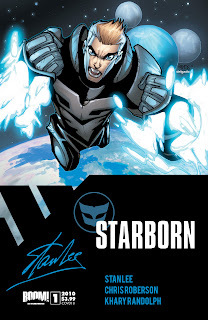 Starborn #1 is one of the greatest first issues I've read in along time, and my clear favourite of Lee's BOOM! explosion leading out of the starters gate. Meet Benjamin Warner, he's trapped in a carbon-copy office job, with a carbon-copy life. Get up, work, sleep and repeat, with all spare time and thought channelled into his sci-fi novel Human Civilisation, in the hopes it and he will get discovered and he'll finally have the life/job of his dreams. Well, he's about to get both, just not the way he was expecting. It seems before his time another author Benjamin's never heard of wrote simillar galactic themed stories and no one wants him or his 'second hand' tale. Except that is for the hive minded warriors that turn up to take in the dejected average joe, ones that appear just like the villians of his fictional creation. From there, the book kicks the fun into overdrive with shape-changing warrior women, reunions, exploding buildings and alien attack parties. All in one issue, by a creative team all on the fast-track to the top. Writer Chris Roberson (the pitch-hitter that has been called in to handle the remainder of JMS's Superman arc) has an amazing knack for natural dialogue and pacing. Having read his skills here, I am 110% certain his run on Superman will extend beyond the length of JMS's forecast run, and hopefully drive more attention towards this book. How well Chris hears such a new character's voice is amazing. 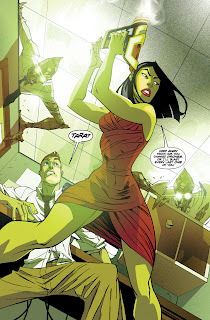 If one part of the book is worthy of obsession though, it is the art of Khary Randolph and colourist Mitch Gears. 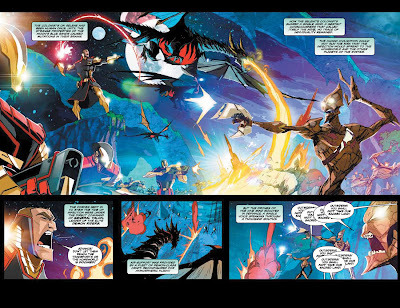 Not only is it bold, clear and distictive, the idea of creating three different visual looks for Ben's past, his present and his self created fictional universe is a stroke of artistic genius. 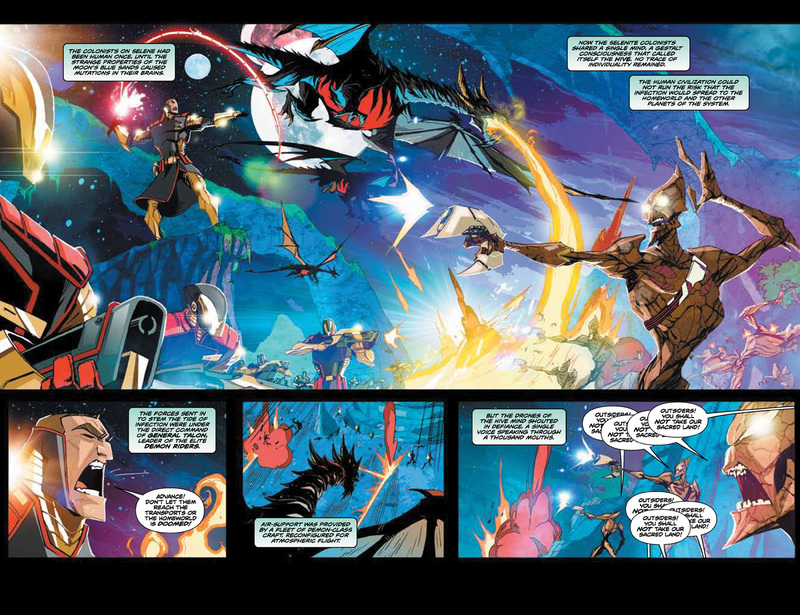 As a reader it helps you keep track of where the pace has teleported to next, and just makes for one pretty damn trippy comic. Trust me, if you need a stocking filler for any reason or only step outside the 'Big Two' once this year make this title it. the artwork is absolutely gorgeous. How are some of the other Boom! titles? BOOM! Is awesome. They really do have something for the whole family, and I take my hat off to them for making real efforts to publish kids comics, like they have done with the Disney and Pixar characters. My Mum had Uncle Scrooge comics as a kid and it was nice a while back to get her a few to have a some laughs with, with the same old faces. For adults 28 Days Later is a safe bet, Hellraiser will join that soon, and then for good clean super-heroics the Stan Lee BOOM universe is just getting underway so it's easy to latch onto. 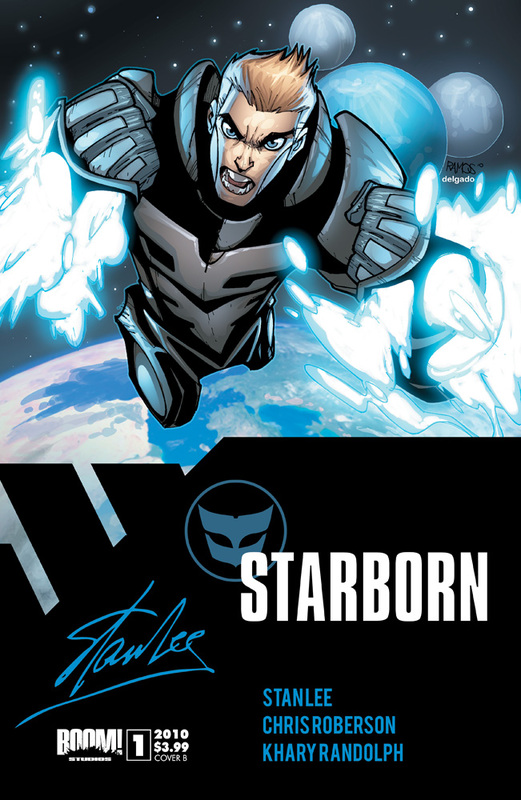 Starborn is easily my pick of the three. If you do work out some dosh for a BOOM! time let me know what you think of what you pick up! I'd heard about the new Hellraiser title coming out, but I didn't realize it was signed with Boom! I'll definitely try to track that one down. Can't pass up an opportunity to pick up some new Clive Barker. If I do find it, I'll certainly weigh in with you. That will be great Craig! If enough folks want to chip in a few words on a book that doesn't get enough IADW airtime, maybe we can do a few 'guest posts' with reviews of them all.